I've been training officially for 12 weeks but if you include the C25K I did to build back up to and general running training I've probably been training since March maybe. I don't know. It's been a really long time. This half marathon has kind of been like being pregnant. About 9 months of putting my body through grueling strain and stress for one big day where I'm in pain for about 2 and a half hours and then after wards someone hands you something shiny and new and you're really proud of what you've accomplished. So I guess I need to do a race recap. 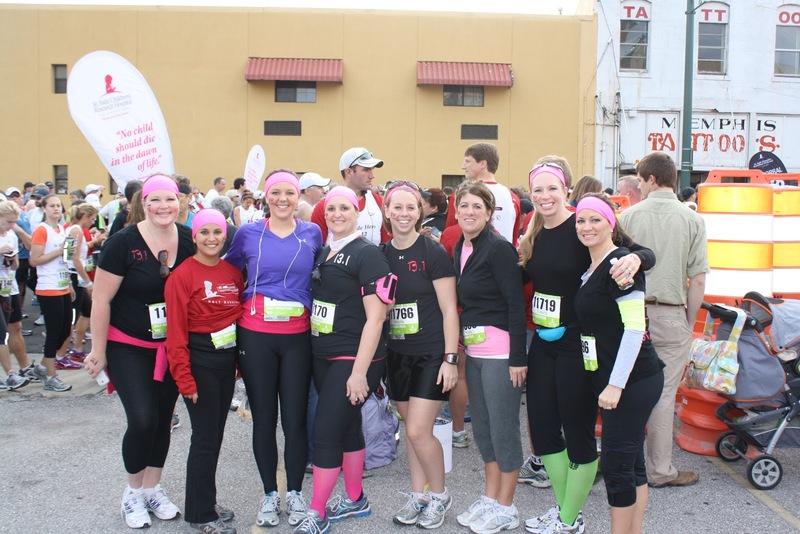 I've been running with a great group of women. I joined them a month ago for Saturday morning long runs. It's been great running with them. We've had good runs, and bad runs. Running with them helped me shave time off my miles and gave me the confidence to be able to finish this thing. Before the race we got together and made matching shirts, bought matching head bands and even had a pre-race carb load pot luck. It was great to have a group to line up with. I love these ladies! 2 of my 3 running buddies and me. The whole running group. 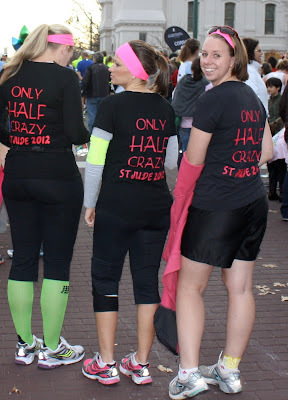 We didn't all train together but we'd talk about how our running was going and keep each pumped up and encouraged. But I digress back to the race. My dear husband set up at about 2.5 miles to take some action shots. 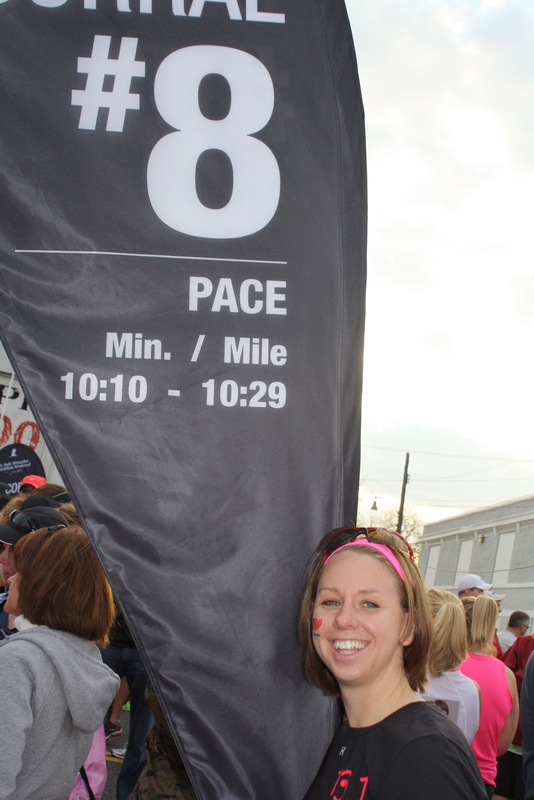 See, look how happy I was early in the run. This was actually a really fun run to do. There was lot of good energy especially for the first half of the race. Downtown was full of people cheering you on. As you run past Autozone a lot of the 5Kers who are finished line the street to cheer. After that you head through the St. Jude campus where families, parents, and even patients are outside cheering you on, saying thanks, and telling you you're doing a good job. Then it's a long run up North Parkway but even that was mostly filled with people cheering. 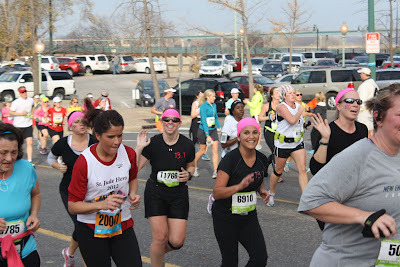 At about the 5 or 6 mile mark I lost Hallie and G. And by mile 7, Abish and I were separated also. So going into Overton park it was starting to get difficult. The crowd had thinned out. Some blisters had formed on my feet. My running group was no where in sight. Thankfully I have some really great friends and they actually came out to Overton to cheer for me. They even made signs. 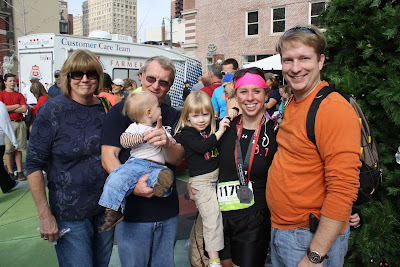 And then they drove all the way downtown to be at the finish line to cheer for me again. Cam, Susan, me, and Steffanie and my favorite sign. Sweat is liquid awesome. 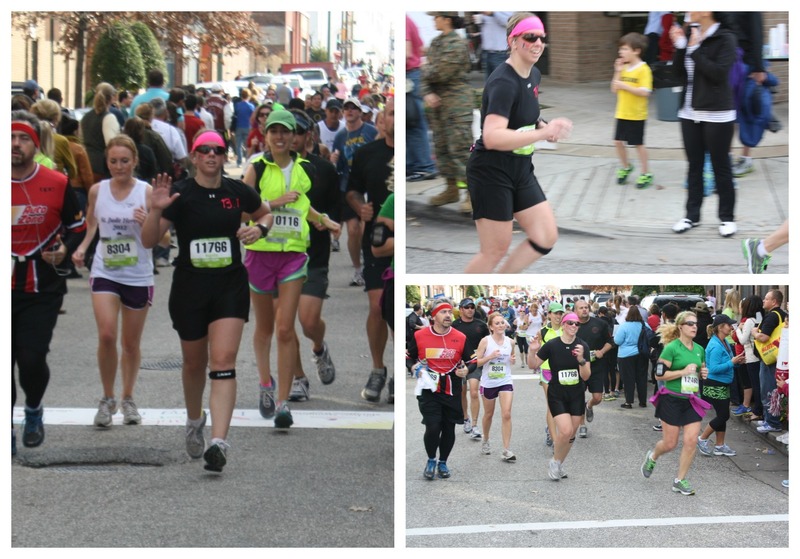 But after I passed them at about mile 9.5 or 10 the wall was right in my face and I hit it hard. I pulled out my music and that helped a bit, but the long run down Poplar that was described in the race pack as "rolling hills" felt like a dadgum lie! There was tons of hills and they seemed pretty steep. I just started telling myself to take it one mile at a time. I'm terrible at drinking from a cup while I run I wind up swallowing wrong and gagging. So I just kept telling myself to run from one water station to the next. Then walk for a few steps while I drink and it was just another mile to go. So that's what I told myself for the next 3 miles as I ran and ran. Around 11.5 miles the 4:40 marathon pace group caught up and passed me. My goal was 2:30, but I was secretly hoping for 2:20 so when they passed me I tried hard to keep up with them. By the 12 mile mark they were out of sight and we half marathoners made the turn to the home stretch. I was expecting to see my family inside Autozone so it was a sweet and welcome surprise to see so many smiling faces calling my name and holding signs for me as I came down the last street before entering the stadium. 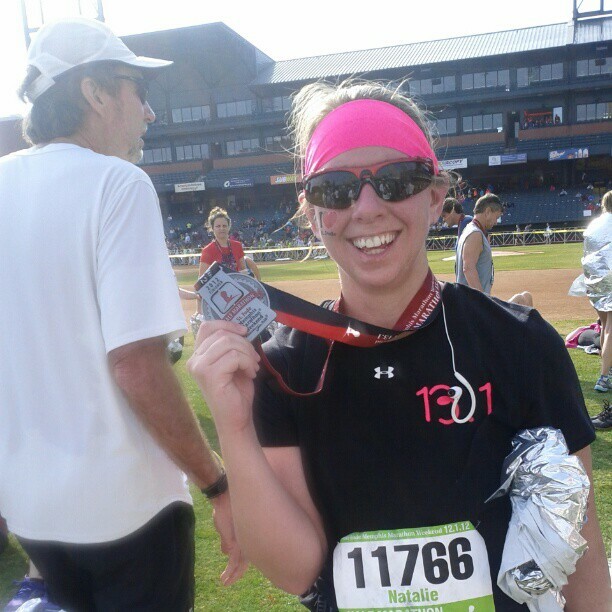 Then I rounded the outfield to the finish line and got my shiny medal. I should have stretched more properly but I was excited to find my running buddies and most importantly find my family. And man with how sore I am today I sure am wishing I had done my proper stretching routine. Whoa buddy! And I think the most cruel thing is after running 13.1 miles you have to climb stairs to get to the food tent! Terrible. I was having to use the rails to pull myself up the stairs. The reception was quite nice, you're basic post race food: fruit, nutrigrain bars, muffins, but also pizza, doughnuts, soup, hot chocolate, chocolate milk. I grabbed a little bit of everything and promptly regretted it. I only at about 2 bites of pizza, half a banana, and a little bit of soup and I felt like dirt the rest of the day. Then I hobbled off to find my family and friends. Spain had brought supplies and was helping Sarah make me a pretty poster. My parents drove all the way to town just to cheer for me at the finish line. The drove 6 hours for less than a 24 hour visit because they love me that much! 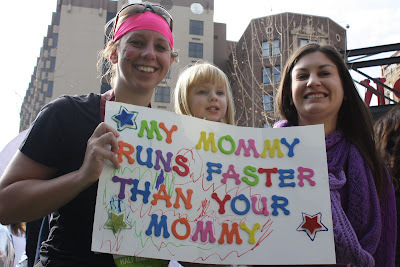 As I ran down the home stretch I saw mom holding a sign that said something about being proud of me. This is the sign Susan was holding at Overton park for me. 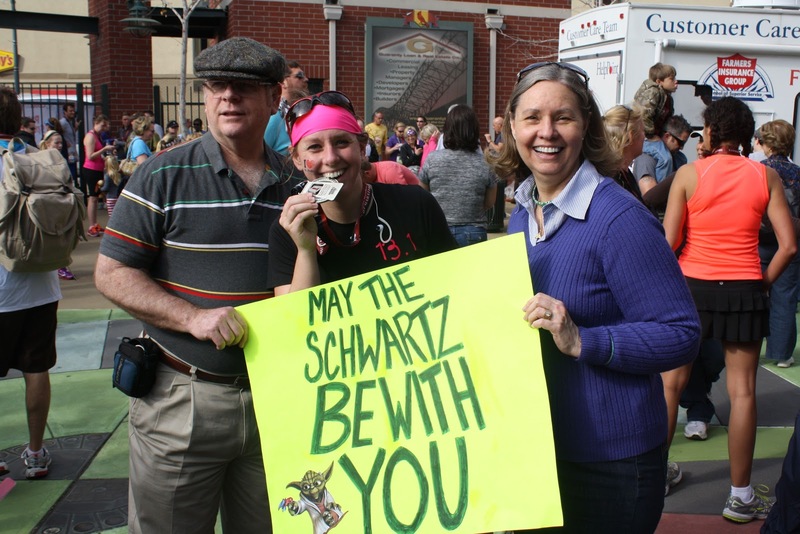 The Schwartzs watched Sarah and Cody the night before so we could go to our running group's carb load party. 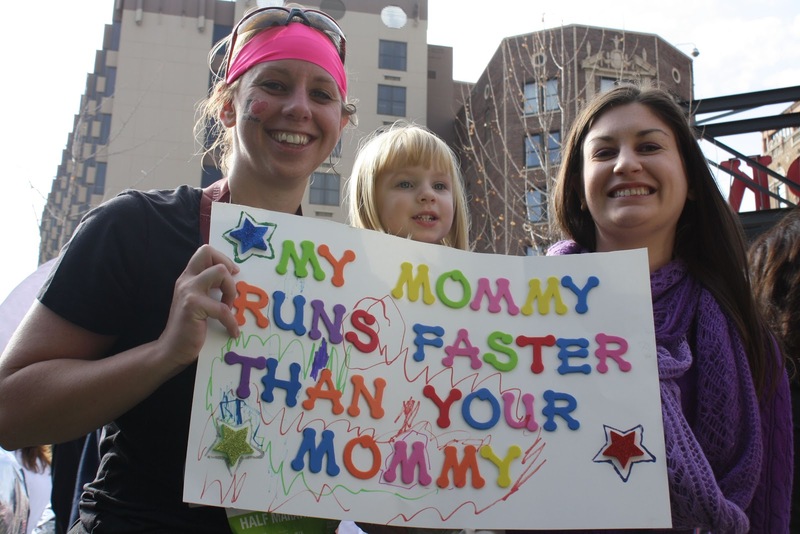 Then they came down to cheer for me at the finish line and brought my cute kiddos so they could see mommy run. Sarah and Cody both really love my medal. I've found it around Sarah's neck a few times already. The final official result was 2:22:03. I ran my first half in 2 hours and 22 minutes! I can't believe it. I came in under my 2:30 goal and pretty close to my 2:20 goal. I did the best I can and I'm proud of myself. Even though I'm super sore today I actually am considering doing it again next year. I guess if I'm going to run that far and that long on purpose there's only 2 reasons to do it. Disney World, and for the kids of St. Jude. I cant believe its already come and gone! What a lousy friend I am. Ive had intentions all week to mail you a card with the ultimate pep talk and well wishes. Im glad you didnt need it! Im so proud of you; so impressed! I love your support group. You are loved by so many wonderful people. Im also glad that you found a great group of friends in your running group. Your time is amazing!!! Way to prepare, prepare, plan, plan, train, train, and then CONQUER! You truly inspire me! Awesome, awesome job! 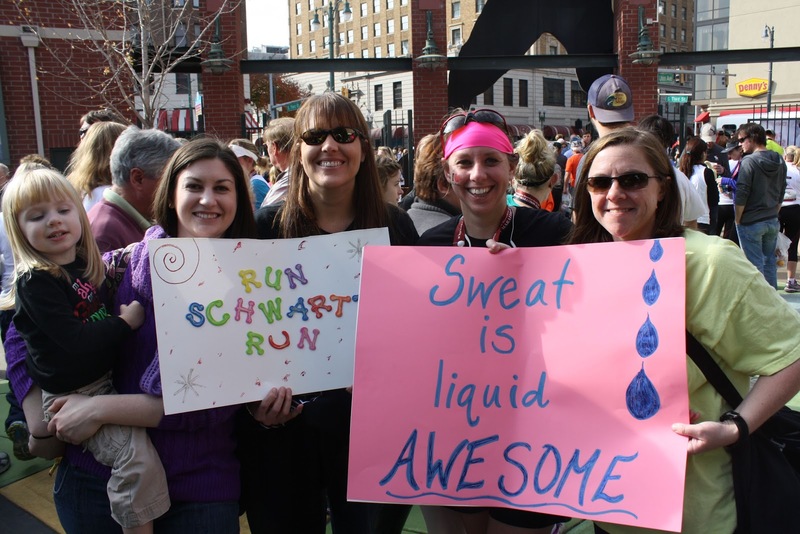 I saw that "liquid awesome" sign on the course - ha! I'm glad it was a great experience for you. It's a HUGE accomplishment and you should be very proud! Blessings to you and your family! To be fair, Sims came up with the slogans and brought the supplies. And did the art work. She finally got to experience math hands while coloring, too! I just stuck on the letters and colored wih Sarah. Oh, I printed and cut out yoda. That's the extent of my artistic ability. Seriously proud of you. You almost make me want to try running again. Almost.